Competition deadline is Friday 14 June 2019 and no further entries will be accepted after this date. Entrants may enter up to three photos per person. 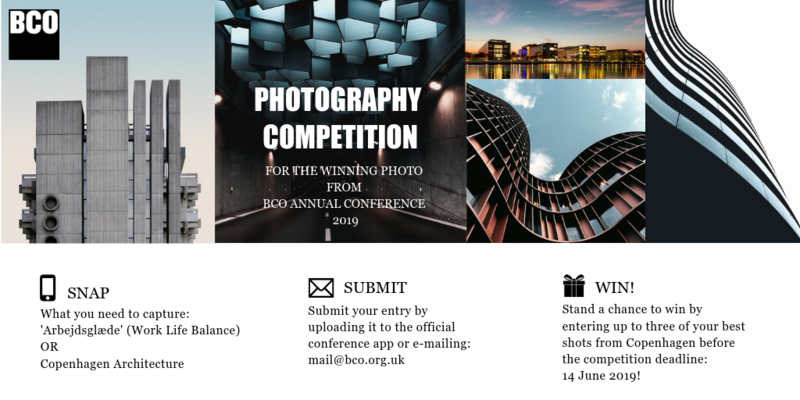 This is a competition for the winning photograph from BCO Conference. ALL levels, whether pro or amateur are invited to participate by capturing and sharing their best photos from Copenhagen. A first place, runner-up and highly commended will be chosen. Choose one of the 2 categories/subject matters above then submit up to three images of your chosen category. Eligibility: BCO Conference attendees ONLY. Only photos uploaded to the official conference app gallery (coming soon) will be counted. However, should anyone experience any unforeseen tech issues, e-mailed entries will be accepted by sending them to: mail@bco.org.uk. Copyrights and usage rights: Winning images will only be used in connection with the competition and accompanying publicity and will include appropriate photo credits.